2. 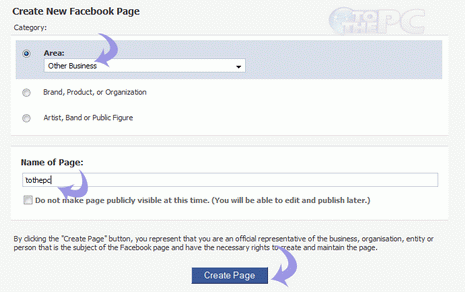 Then open Facebook pages website, click ‘create a page’ button. 3. Select category and enter a suitable name for your fan page. For blog or website Fanpages, select website option under ‘Brand, Product or Organization’ setting. 4. Click on Create Page button to make your Facebook fan page. Now you can share the your Fanpage with rest of the world and increase your fan following. Of course, you can become TothePC fan at TothePC Fanpage.